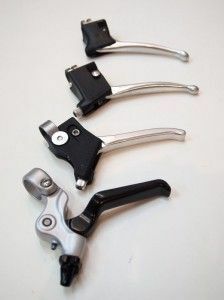 Replaced the brake levers on the brompton from the original older ones to the modern brake levers. Seems that the bike now doesn't fold properly anymore. Wonder what I have done wrong. The most recent levers need to be fitted to the most recent handlebar (unless an S). The U-bend is narrower, giving more room for the bigger Brompton levers. Have gone from the top to the bottom I think. Looking at pictures, I've angled the levers too straight ahead when they should be pointing down. On my S-type the limit with the new levers is where the cable exiting the lever just presses up against the fork blade. The rest of the lever has a bit more breathing room in amongst the spokes of the front wheel. It's still quite a downward-pointing angle, and IMHO it's one of the major ergonomic compromises of a Brompton, particularly for smaller riders. Pointless thread, was my mistake.